InnoSolve is soluble in cold water and is not harmful to the environment: it is odourless and 100% biodegradable, which makes it extremely suitable for printing support structures. Innofil InnoSolve 0.75kg. 2.85mm diameter and approximately 90m long. 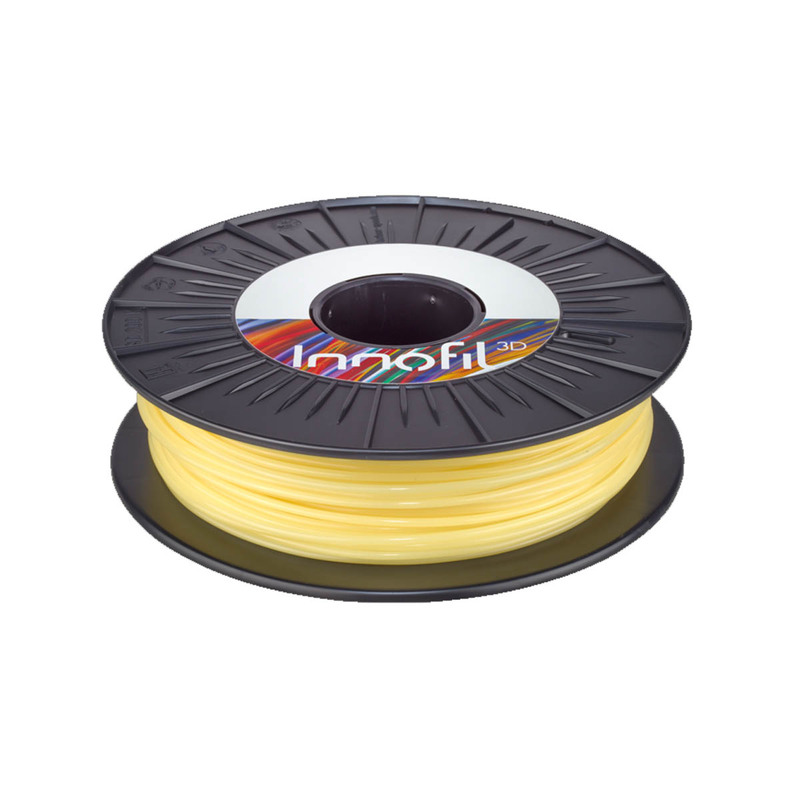 InnoSolve (Polyvinyl Alcohol Compound) 3D printing material, which makes it extremely suitable for printing support structures in complex PLA and PET prints on a dual or triple-headed 3D printer. InnoSolve has a natural yellow-white colour. InnoSolve is soluble in cold water and is not harmful to the environment: it is odourless and 100% biodegradable. It dissolves overnight in cold or warm tap water or in the dishwasher (1 cycle – not recommended with PLA prints: PLA is susceptible to degradation under wet conditions and under higher temperatures). Store this monofilament in a sealed bag or container to prevent from getting sticky. PP (Polypropyline) is a high-performance thermoplastic with low density, high elasticity and a high resistance to fatigue. It is an ideal material for 3D-printing applications which have to endure high stress or strain. PVA (polyvinyl alcohol) is a water soluble support material for multi-extrusion 3D printing. Designed for a seamless 3D printing experience with the Ultimaker dual extrusion printers, this PVA provides good adhesion to both PLA and Nylon. PP (Polypropyline) is a high-performance thermoplastic with low density, high elasticity and a high resistance to fatigue. It is an ideal material for 3D-printing applications which have to endure high stress or strain. Ultimaker PP is perfect for the Ultimaker range of printers.